Northern European tourists and collectors in the 1600s and 1700s eagerly acquired pietre dure (hardstone) plaques and mosaic scenes produced by Roman craftsmen on trips to Italy. When the travelers returned home, they had these souvenirs mounted onto boxes and furniture. The hardstone plaques on this pair of cabinets all date from the late 1600s; they were probably made by Italian craftsmen working in Paris at the Gobelins Manufactory. Because of their value and continued popularity with collectors, these plaques were mounted in cabinets specially designed to hold them, nearly one hundred years after their creation. 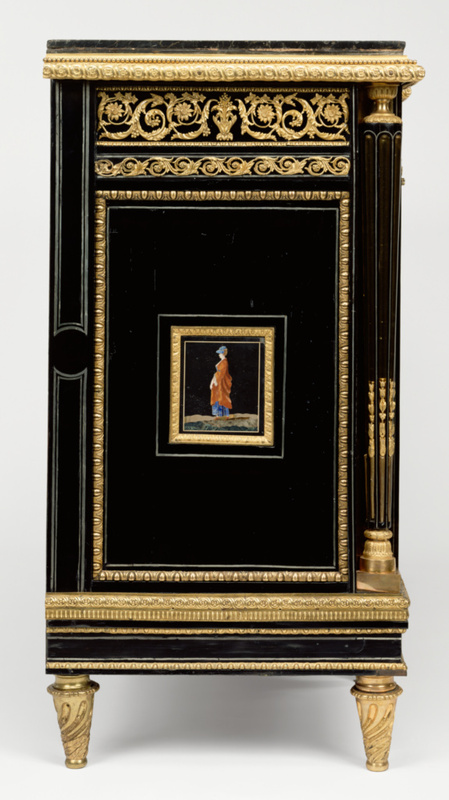 The catalogues of two sales held during the French Revolution describe this cabinet. William Beckford, a wealthy English connoisseur of hardstones, probably purchased it in the late 1700s. 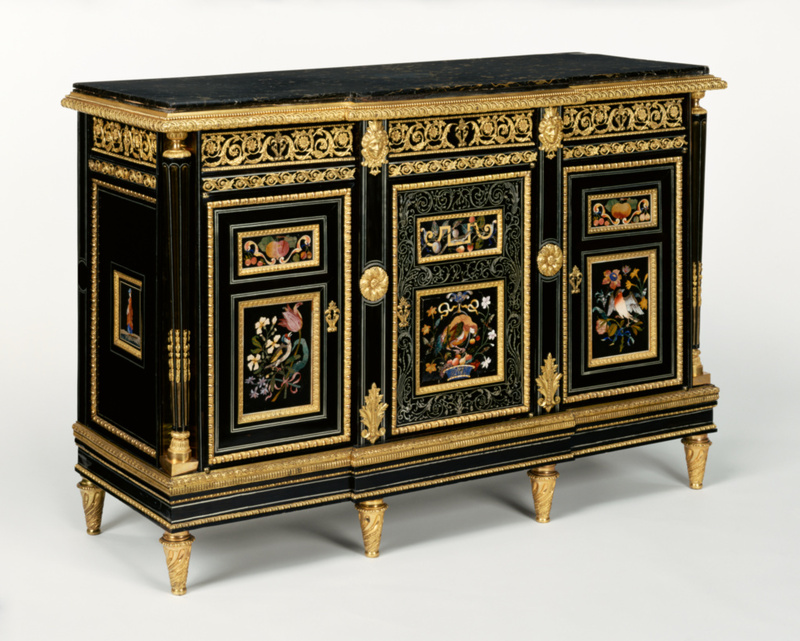 He may have ordered another cabinet made to match it, with identical gilt bronze mounts and dimensions. Alexander Archibald Douglas, tenth duke of Hamilton and seventh duke of Brandon, Scottish, 1767 - 1852 (Hamilton Palace, Lanarkshire, Scotland), 76.DA.9.1-2: purchased in Saint Petersburg as one of a pair at the cost of 6,000 rubles; by descent to his son, William Alexander Douglas, eleventh duke of Hamilton and eighth duke of Brandon. Source: the pair of cabinets was displayed in the old state dining room from some point after 1813 and before 1825. Information courtesy of Dr. Godfrey Evans, Director of the Virtual Hamilton Palace Trust. William Alexander Archibald Douglas, eleventh duke of Hamilton and eighth duke of Brandon, Scottish, 1811 - 1863 (Hamilton Palace, Lanarkshire, Scotland. ), by inheritance to his son, William Alexander Louis Stephen Douglas-Hamilton, twelfth duke of Hamilton and ninth duke of Brandon. Source: Correspondence from Theodore Dell to J. Paul Getty, in the file of the J. Paul Getty Museum, Department of Sculpture and Decorative Arts. 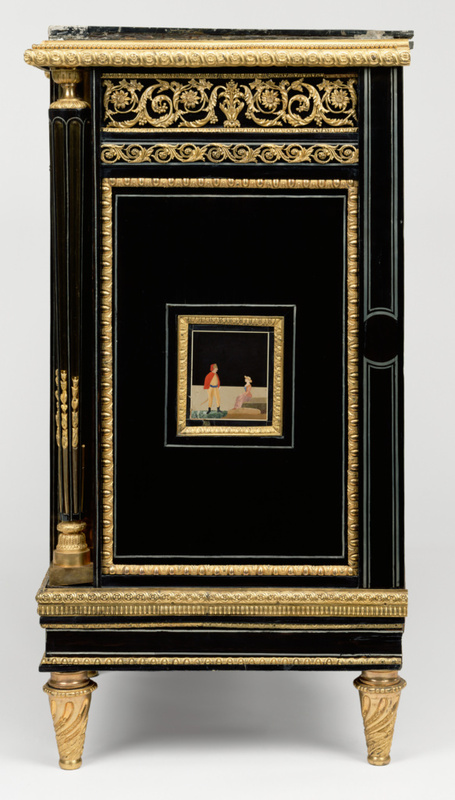 Aveline & Co. (Paris, France), sold to the J. Paul Getty Museum, 1976. Gonzàlez-Palacios, Alvar. Mosaici e pietre dure: mosaici a piccole tessere, pietre dure a Parigi e a Napoli (Milan: Fabbri, 1982), p. 48, ill.
Kjellberg, Pierre. Le Mobilier français du XVIIIe siècle: Dictionnaire des ébénistes et des menuisiers (Paris: Éditions de l'Amateur, 1989), p. 872. Gonzalez-Palacios, Alvar. "vecchio barocco & nuovo classicismo." Casa vogue antiques 13, no. 13 (May 1991), p. 77, 79, ill.
Giusti, Anna Maria. Pietre Dure: Hardstone in Furniture and Decorations (London: Philip Wilson, 1992), p. 218, fig. 76. Bremer-David, Charissa, et al. Decorative Arts: An Illustrated Summary Catalogue of the Collections of the J. Paul Getty Museum (Malibu: J. Paul Getty Museum, 1993), p. 22, no. 18. Ramond, Pierre. Chefs d'oeuvre des marqueteurs. Vol. 1, Des origines à Louis XIV (Dourdan: Éditions H. Vial, 1994), p. 68, ill.
Wilson, Gillian, and Catherine Hess. Summary Catalogue of European Decorative Arts in the J. Paul Getty Museum (Los Angeles: J. Paul Getty Museum, 2001), pp.11-12, no. 18. Hall, Michael. "A 'splendid and probably Unique Pebble': the Benetier de Charlemagne.'" The Burlington Magazine 154, no. 1311 (June 2012), p. 390.